Serve Homemade Italian Meatballs for an easy dinner and leftovers on a bun for lunch. Authentic Italian meatballs make a great freezer meal and the meatball recipe is perfect paired with our easy homemade spaghetti sauce. So I’ve been keeping a secret. A very delicious secret. And it’s these Homemade Italian Meatballs. You know we share only the best of our family recipes and this one definitely ranks as one of the top. This is an old family recipe from my mom’s side of the family. Although we are not of Italian heritage in any way, a distant relative married an Italian woman, who then let the family in on her authentic Italian meatball recipe. Although I’m sure authentic Italian meatballs are made many different ways, we are so in love with this version. Of course I’d have to say what I love the most is the taste and texture of the meatballs. Tender and savory, just the way a meatball should be. But a close second is how versatile this recipe is. Let me take you through an example of how you can make this into an easy freezer meal, slow cooker dinner, and yes, even a school lunch for the kids! 1. The first step is to make and bake the meatballs. Genius, I know. You can always count on me for the obvious. 😛 I know there are some days when you are so busy you can hardly breathe. But there are probably days, too, when you have a little bit of free time. Use that time to get ahead and make up a batch (or even a double batch!) of these meatballs. 2. There’s several options you can choose between next. First, you can freeze the meatballs for later. Split the meatballs up in whatever size Ziploc bags you’d like and pop them in the freezer to use at another time. Another option is to use the meatballs right away. You can add them to a pan full of sauce, let them simmer for about 20 minutes and then serve. Or you can put the meatballs in the slow cooker, cover them with sauce and let them simmer all day. Let me tell you that this is by far my most favorite way to eat these meatballs. That extra time in the slow cooker gives them a depth of flavor that will make you swoon. 3. Once the meatballs are cooked, you can serve them over spaghetti, use them in a soup, or make meatball sub sandwiches, which takes me back to my school days! One of my favorite school lunchroom lunches was “Meatball Splash” which was simply homemade Italian meatballs smothered in spaghetti sauce, served on a hot dog bun. Our lunch ladies served these often and I loved them! Now I take this best meatball recipe and serve it on buns for our own homemade meatball sub sandwiches. And your child can enjoy these at school by simply putting the warm meatballs and sauce in a thermos. Send along spoon and a hot dog bun in a baggie and they can make their own sandwich at school. If your kids are like mine, they grow tired of peanut butter and jelly very quickly. They’d be super happy to have a home cooked comfort meal for their school day. Italian Sausage: You can buy Italian sausage…or make your our favorite Italian sausage seasoning recipe. Medium Cookie Scoop: To get all of your meatballs a uniform size, use a cookie scoop. Here's a recipe for classic, Homemade Italian Meatballs. Serve them for dinner topping a plate of spaghetti and send the leftovers with your kids for lunch to make a meatball sub sandwich. Roll into 1 1/2" balls and place them closely together in 9x13 pans that have been sprayed with cooking spray. Bake at 350 degrees for 35 minutes, or until the meatballs are cooked through. 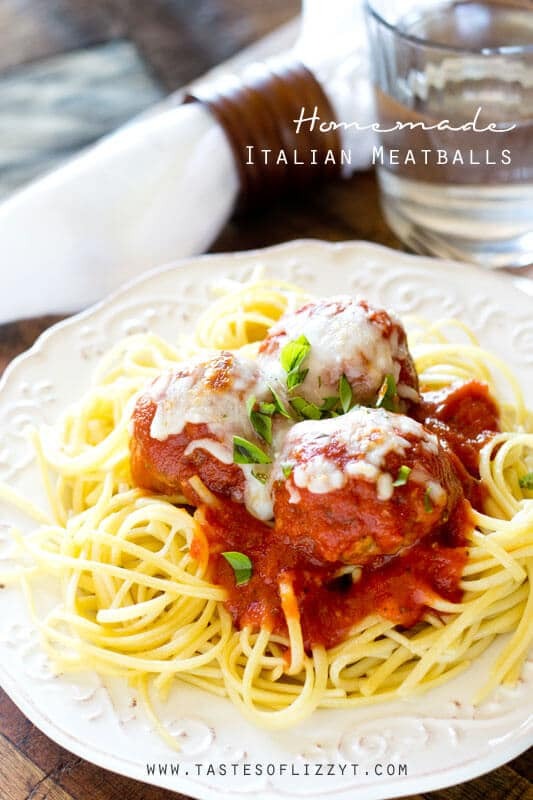 Serve the meatballs immediately with sauce and spaghetti, put them in the slow cooker along with sauce to have them simmer, or freeze the meatballs in Ziploc bags to use another time. meatball splash? Now that is one I haven’t heard before but I’m intrigued! This looks absolutely delicious! Step #1 made me giggle. Your recipe is so simple yet seems incredibly delicious! Can’t wait to try it! Classic spaghetti and meatballs awesome but this sandwich would satisfy any kid in school too! Gorgeous photos! I have no Italian heritage but I wish I did because Italian food always look so good!! I’ll have to try my hand at these, I might surprise myself, haha! Just beautiful! This is the kind of dish that is good for the soul! My daughter’s favorite thing to bring to school is spaghetti and meatballs! I just have to try this recipe for her, she will love it, actually our whole family would! It’s one leftover the kids don’t complain about, that’s for sure, Tanya! Thanks! Hello, comfort food! The perfect recipe to enjoy as I catch up with everyone around the dinner table after a long school day. This is a great idea for my kids school lunches! They look amazing! I just love the idea of having them ready ahead of time and throwing them in the slow cooker! Plus my daughter would love this in her lunch! I love packing my kiddos a hot lunch! Meatballs are a favorite in our house and these look wonderful! Thanks, Emily! Nothing beats a good meatball dinner! These meatballs look perfect! Beautiful pictures! Pinned! You are so welcome and thanks for the feedback! Hello, you mentioned that you could put them in a slow cooker and simmer all day. So my question is do I just prepare the meatballs and then add them uncooked to the sauce and cook on low all day? I cook them first just so most of the fat cooks out. That will also help them not stick together! Do you cook the meatballs first or can you just freeze them for later then cook when they thaw? How long can they stay in the freezer? Thanks. I usually cook my meatballs first then freeze, because a lot of times the meat I have is frozen and you should’n’t re-freeze uncooked meat. If you start with fresh beef, you can freeze the meatballs uncooked.I’ve kept them in the freezer for 3 months. Thank you for your quick reply. I’m making these tonight for supper. I have to make 150 meatballs for an American Legion fund-raiser and decided to use your recipe, since it most resembles my best friend’s ingredients to her Italian family recipe that she’s misplaced. Can you tell me how many meatballs this recipe makes? Thanks! I’d say it makes around 50 meatballs, depending on the size.